Children's toys have changed significantly since my childhood. Operation was once a high tech toy. I'll shamelessly admit, I still love this game with the annoying buzzing sound! Its a happy childhood memory that I love. Battery powered and electronic toys can be fun. But why not give it a break? I recently bought King Diaper some new puzzles, and they require batteries. Whatever happened to wooden puzzles that kids dump out and put back together? I don't really feel the need for our puzzles to talk to us about the colors and shapes. Part of it is us talking about what is going on. 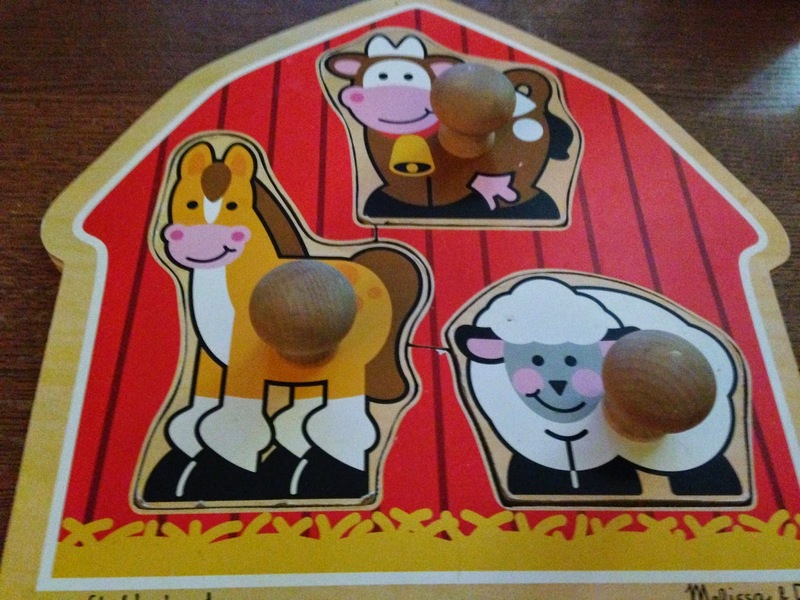 Some of our favorite puzzles are the Melissa and Doug basic puzzles with large wooden pieces and knobs for easy pick up. Our house is overstimulation central. And, I think that my mother enjoys some of this as much as our boo! She is eager to tell me that something has run our of battery power. If I don't change them, she will do it for me. I hate to be the bearer of bad news, I intentionally don't change those batteries. With two televisions, my husband viewing You Tube, and sir mix a lot queuing up every sound driven device in the house, I'm pushed to the brink daily. There is a reason I drive in silence much of the time. There is a lot of be said for classic games and toys! 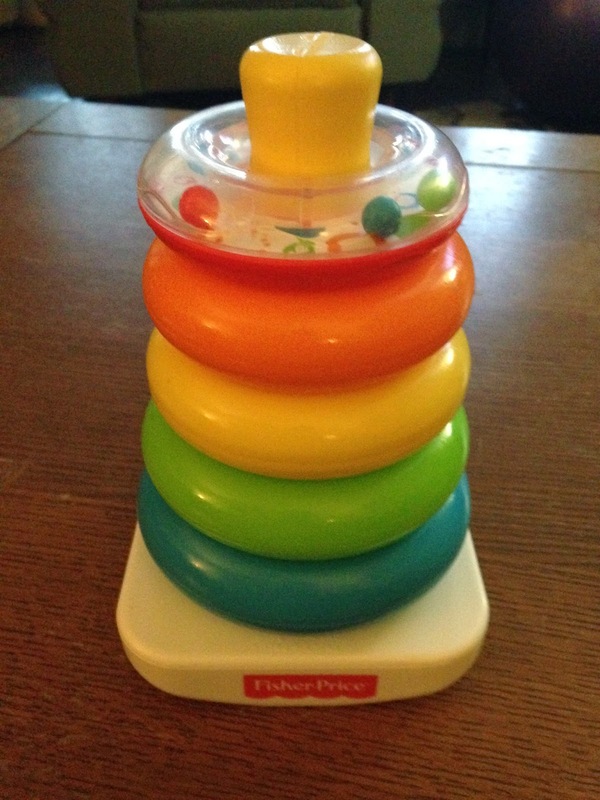 The Fisher Price doughnut stacker is a prime example. It costs about $6.94 and requires nothing more than a kids hand and eye coordination. King Diaper loves it! Target sells a Classic Infant Trio Gift Set. It has three classic toys that would make a great gift or addition to a toy box at your house. Plain and simple wooden blocks offer hours of entertainment for kids. Lincoln logs and Legos are also great. Imagination, hand eye coordination and problem solving are all components of these toys. And these are just easy options for fun! If you are looking for other classics to entertain the kiddos, cards! I spent a lot of time playing cards as a kid. 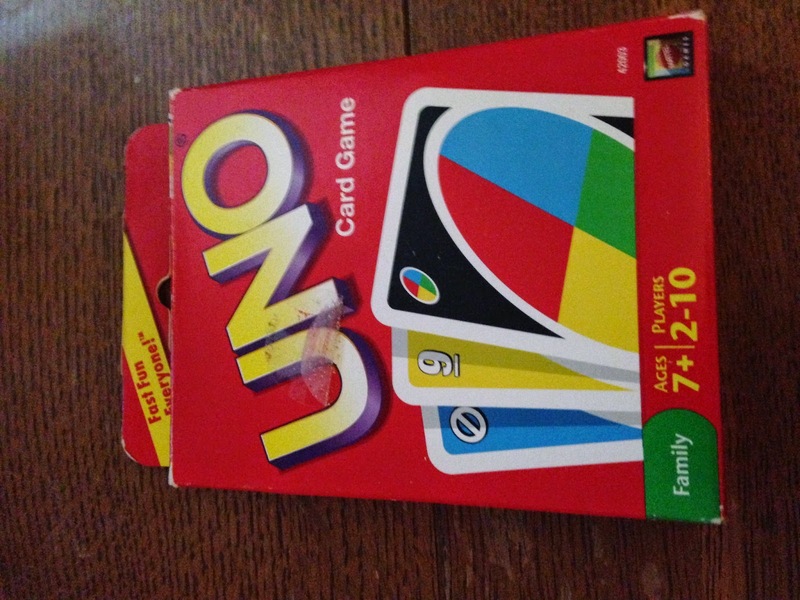 Old Maid, Go Fish, Uno were all favorites. Even as an adult I still enjoy playing grown up card games! I truly believe that every kid should play card games. In the summers, we would play cards under the cool air conditioner as a break from the Mississippi heat. One newer card game that I think is good for lots of ages is Quidler. My aunts introduced me to this game. Its a letter and word building game. Each round you get one additional letter card. The players must make a word(s) from the given cards and take a reduction in points for unused cards each hand. This is a great summer game for the beach. 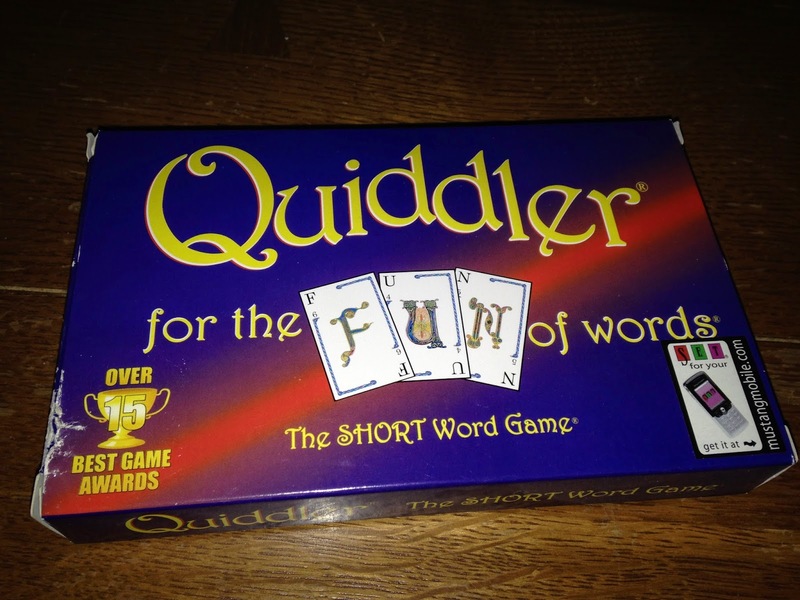 Come indoors and take a break and play a game of Quiddler. Kids are practicing word building skills without realizing they are even doing anything learning related! Most of all, classic toys are just pure and simple fun. They encourage talking and interaction that many times electronic toys eliminate. And yes, we all need a break from that. I work in technology and believe that a break from the techie driven world is a good thing. 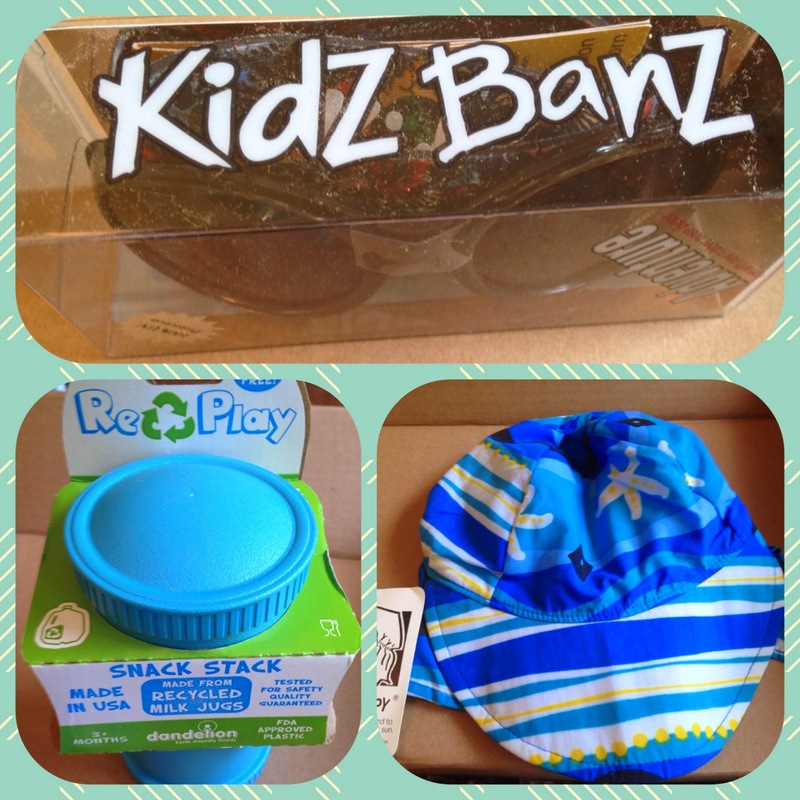 If you are searching for birthday party or baby shower gifts or even something to entertain this summer, keep it simple. Use that time to talk and make happy memories. They last a lifetime. Many of my happiest memories are playing games with my sister, parents or aunts and cousins. It is something we still do as grown ups and are passing on to our children. Family traditions come in all sorts. We are a rather active bunch at our house. More from my prodding than anything else. As the weather has warmed, we have enjoyed going to the local community market on Saturday mornings. We can pick up our local bread, jams/jellies and produce each week. Its a great way to start the weekend! Mainly, our choices depend on what we have at the end of the week. It has come to be one of our favorite things to do on the weekend, and I hope it is a tradition we keep up. Eating outdoors is fun and relaxing. As King Diaper gets older, hopefully we can spend some time playing before going back to the car. 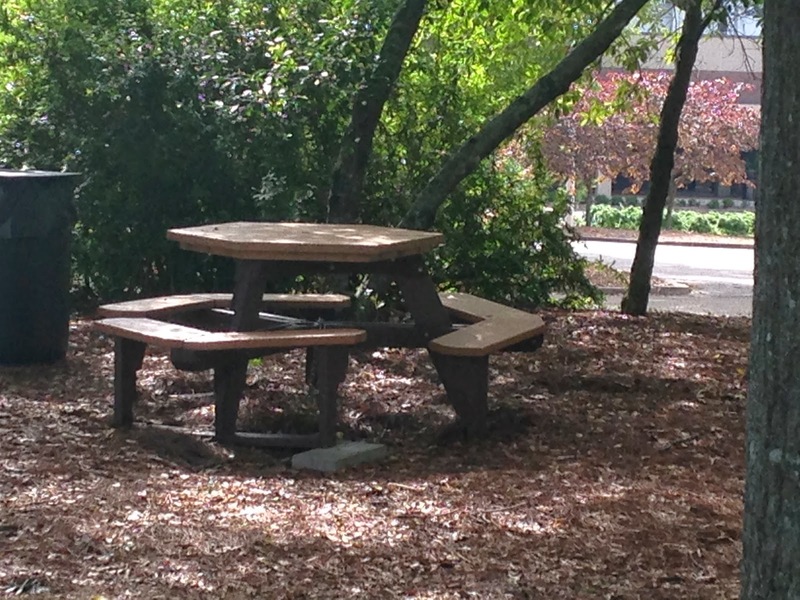 But, for now, he can sit back and relax while we stroll to our picnic spot. 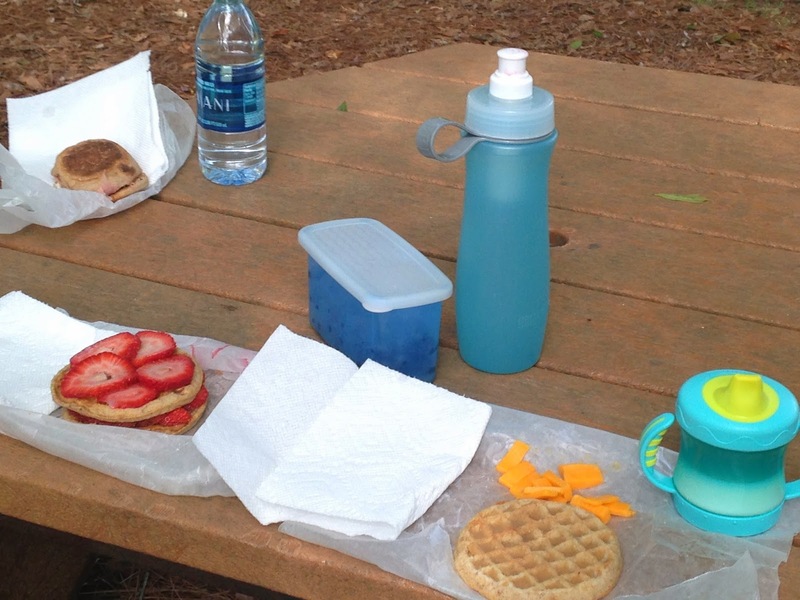 Look for ways to get outdoors with your family and make it a tradition. Its something to look forward to in our weekly routine. Lemons are a favorite of mine. I love anything with lemon flavor. 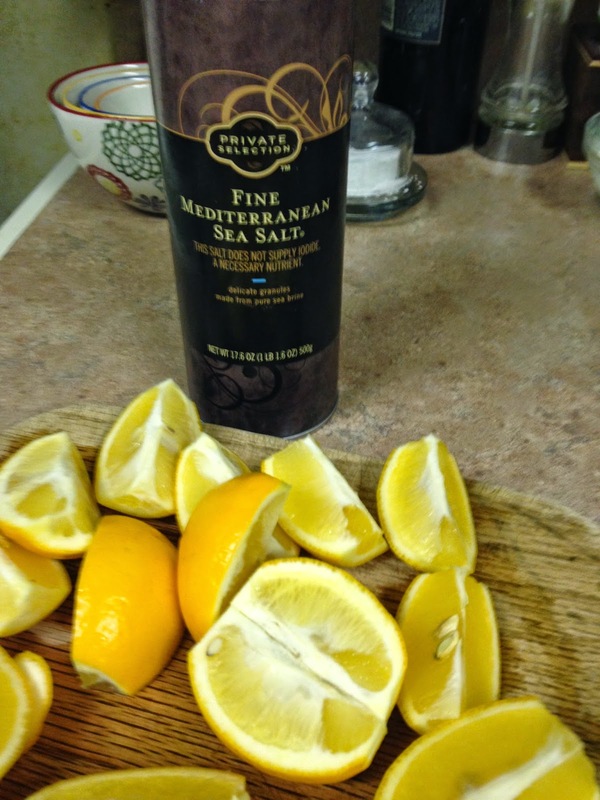 Lemons make dressings, drinks and desserts wonderful. Myer Lemons are my most favorite. When I see them at the market, its something that I can't pass. I first fell in love with them when trying out a recipe for Shaker Lemon Pie. 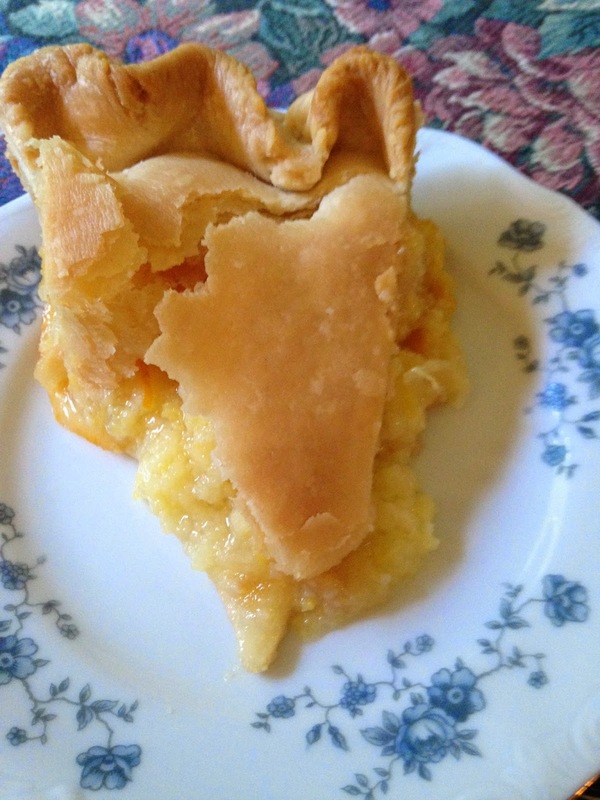 Shaker Lemon Pie is a double crusted pie that uses every bit of the fruit. 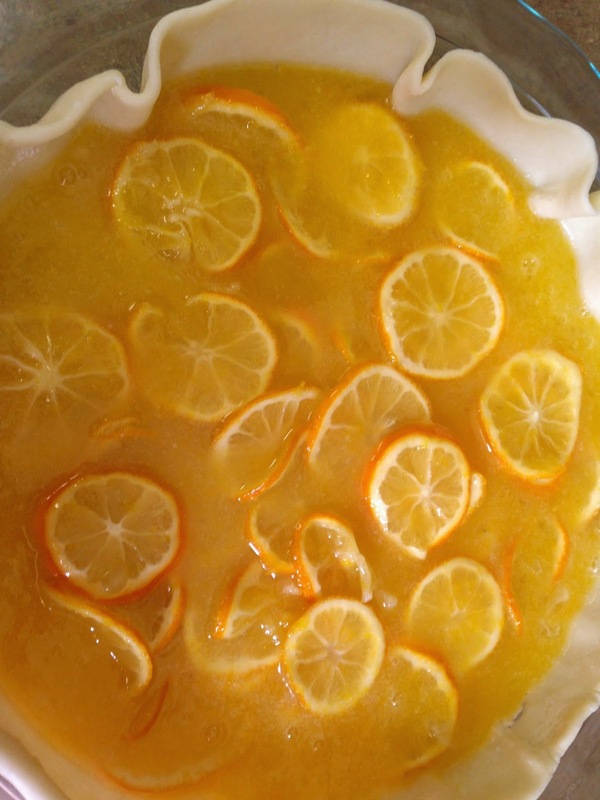 You begin the process by soaking thinly sliced lemons in sugar for 24 hours before making a simple pie containing eggs, butter, and salt along with the lemons. It is sunshine on a plate. Once you have had it, you will dream about it. It is not for the faint at heart when it comes to calories. Just make it for a crowd and enjoy a slice and go on about your business. I refrigerate my lemons the day before slicing to make it easier. You can slice on a mandolin. But make sure you have thin slices of lemons. Place in a non-reactive bowl. Add sugar. Stir and cover. 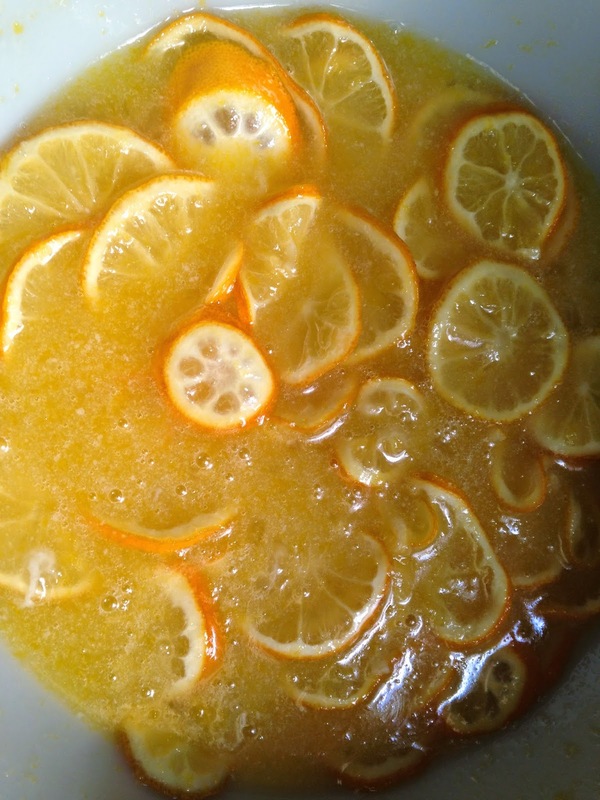 Let the lemons soak for 24 hours. Do not rush this! The next day, you will bake. Preheat the oven toe 425 degrees. Add the salt, eggs, butter and flour. Pour into the crust. 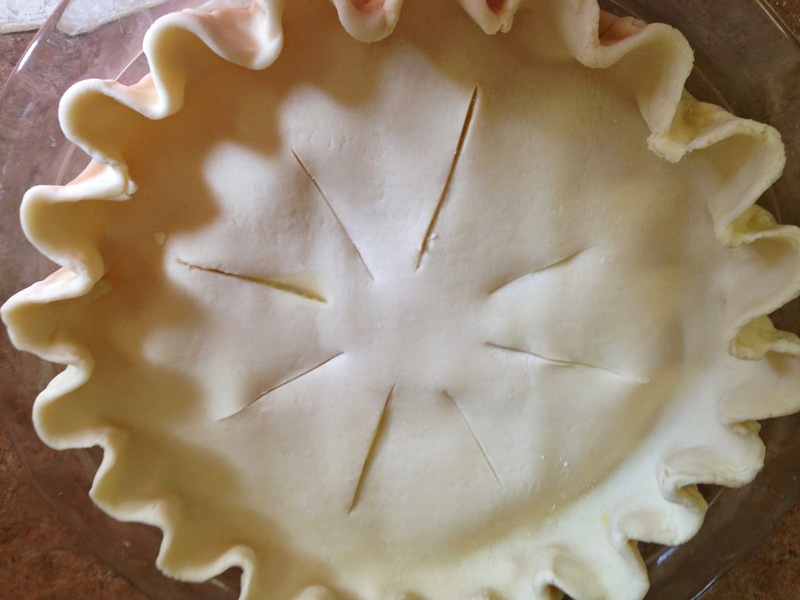 Top with the second layer and crimp the edges. Finally, place venting slits into the top. Bake at 425 for 30 minutes. Reduce the heat to 350 degrees and bake for 25 to 30 minutes more. Cool and serve slightly warm or at room temperature. Shaker Lemon Pie will quickly become a favorite. It is as simple as it is delicious. But don't stop there! 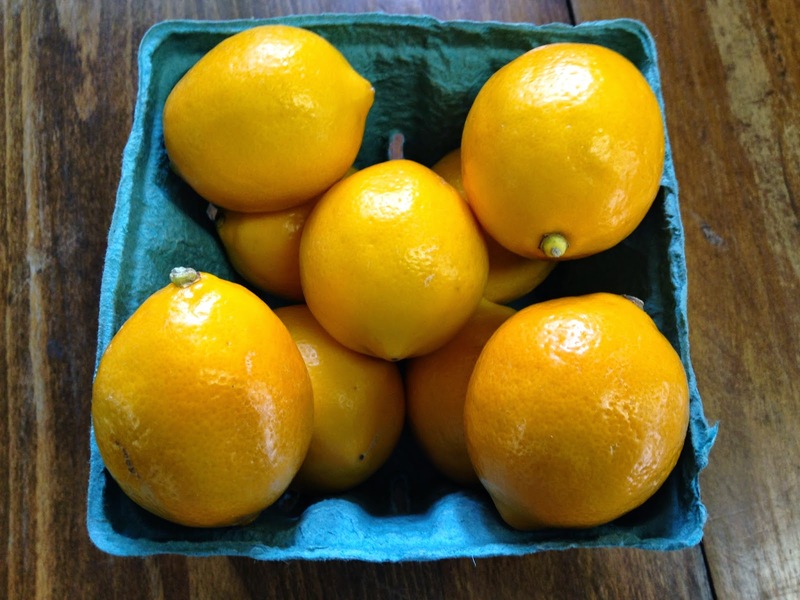 What else can you do with a basket of Meyer lemons? 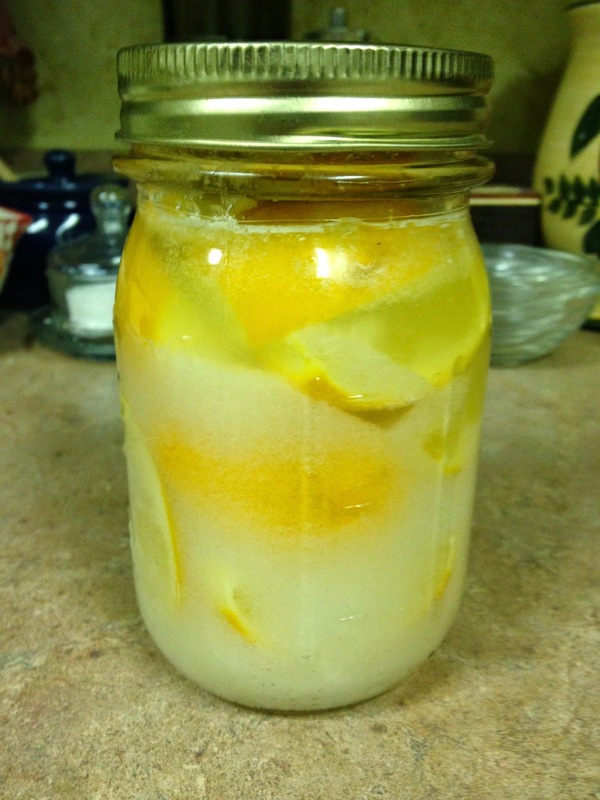 This year, I have heard Lynn Rossetto Casper talk about preserved lemons on her show the Splendid Table. Given my love of lemons, I decided to give it a whirl. Its a simple process of putting lemons into a jar with salt for a few weeks and using them over time to add to dishes and salads. Its so simple that its a shame not to at least try this! So what does one do with preserved lemons. Well, the Splendid Table and lots of other blogs can help you with that. 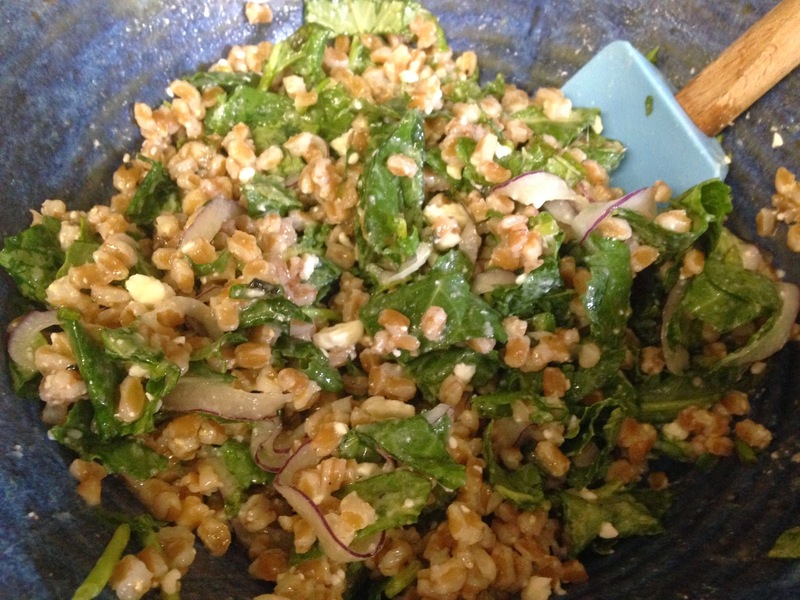 One of my favorites is a kale and farro salad. The lemon adds a brightness and lift that is like none other. 1 cup of farro, cook based on the packaged directions. This will serve as the base to your salad. From here, you can add any combination of ingredients that work well together. To make this salad, cook the faro and add whatever seasoning you like. The preserved lemons are a great addition to salad and give it a bright punch! Add some sunshine to your life with lemons. They aren't just for table water or squeezing over salads. They season and add something to lots of recipes. And finally, don't skip the lemon if a recipe calls for them. Trust me on that one. They accomplish more than you think. Keep a bag or basket in your fridge. You will never run out of uses for them. Have a great week! Make something delicious with the lemons in your life! My limited amount of time for shopping sometimes makes it more of a chore than something fun. When I am shopping, it is normally in a hurry. Once a year, I take off and go to Mistletoe Marketplace with two of my dearest friends. Outside of that, I go the express route. Items for sale appear in my feed - either on Instagram or Facebook. Companies also offer payment through PayPal which further simplifies things. So how does social media shopping work? It varies by vendor. Auctions typically ask that persons register with their check out system. If you find an item you like, comment on the item according to color or size. And you can pay directly through a Soldsie account of something similar. Other vendors may simple add a link to photos and posts for shopping at their online store. Either way allows shoppers to purchase items while browsing social media. Its a great way to pick up unique items at a time that fits your schedule! One of my favorite companies for children's clothes through social media outlets is Lambs in Ivy. They have a Wednesday night auction each week at 8 p.m. There are typically previews available ahead of time. Featured clothes include smocked items, basic pieces and holiday/seasonal attire. Each item I have gotten has arrived quickly and is of excellent quality. Best of all are the prices. I think the pricing is very reasonable! I have purchased a few items for King Diaper this way. 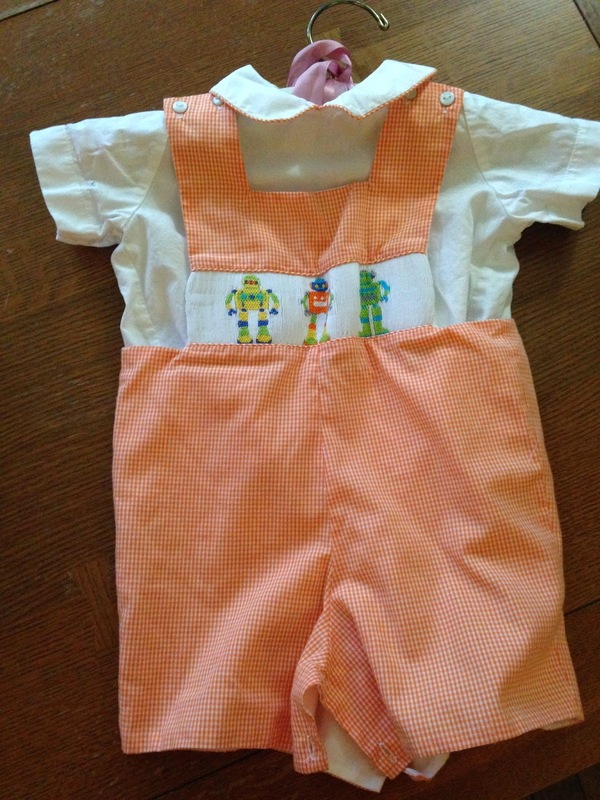 Earlier this year, I purchased a little smocked john john with robots across the top. It was a complete outfit that came with a button down peter pan color shirt for $34.99. Recently, I purchased an outfit for this fall/winter. Its a corduroy long all with a stripped turtleneck. I had the long all monogrammed. This will be a great outfit to have during the cool weather months this year. Everything, including monogramming, was around $45. Basic pieces are probably my favorites. I have purchased both a seersucker bubble and knit sun suit. Both have been monogrammed. And, yes, I do love monogrammed items. I can't help it. Monogramming through Lambs in Ivy runs $10 per item. With free shipping and the cost of the items, I feel happy with the price. Plus, lots of shops charge $12 or even more for monogramming. So, I feel like I'm getting a bargain. If you haven't tried shopping through social media, give it a try. Like a couple of companies that feature online sales and auctions. Reminders and sale items will start to appear in your news feed. Shop when it works for you. You aren't married to any of the shops, sales or auctions. You can get them off of your feed anytime that it no longer works for you or interests you! You can even shop socially for grown up clothes. Zig Zag Sripe has lots of cute clothes. They offer a range of sizes, jewelry, and even shoes. Yes. They offer free shipping as well. Its a fun and easy way to shop. Give it a try. The convenience alone will win you over! Have a great week! Probably until this point, I had only known of body/baby powder, loose powder and pressed powder. They each serve a unique purpose and that is that. However, I have recently discovered finishing powder. And yes, it does have the power to change your world! So does it deliver? Yes! And, worth every penny! You will only need a small amount. Therefore, this stuff will last a few minutes! I purchased NARS Light Reflecting Loose Setting Powder from Sephora and will never look back! There are lots of brands on the market, but this one has worked great, and I plan to keep using this until I find something else. Apply your toner or other primers if you use them first. Next, apply your BB or CC cream. I prefer a BB cream just because they seem to be lightweight and great for summer! Make sure that you choose the coverage and color that works well for you. This powder will not give you any cover. It will ONLY finish your look. Add blush. I use Nars blush as well. 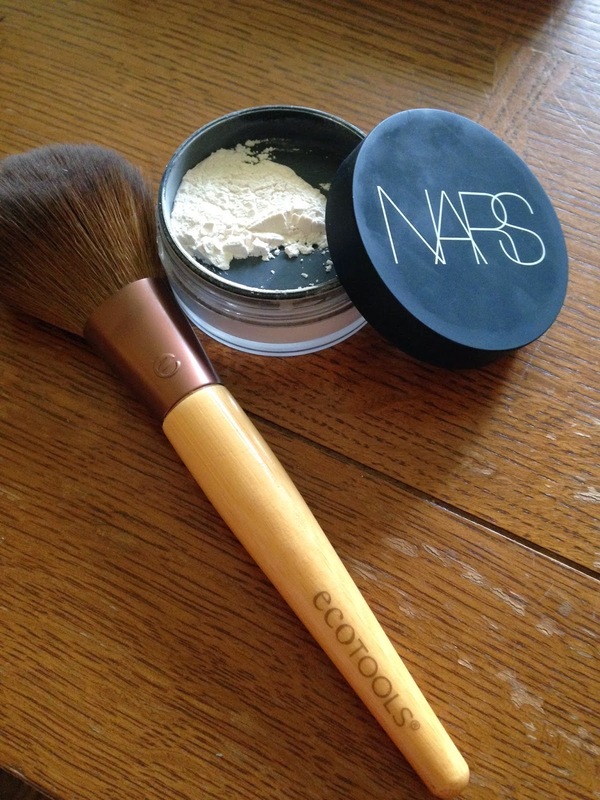 Finally, add your finishing powder. Afterwards, add your eye make up and lipstick and you are done. I still touch up once in a while during the day. But I feel like my make up looks very natural. It lasts all day and makes my skin super smooth. If you are looking for something sheer to use in the summer, this is for you. It just sets your make up and you are done. Give it a try. I think you'll find that you love it as much as I do! Insurance for Maternity Leave - Is it a scam? Most working women are faced with the option of short term disability insurance. And most of us are lured in with, "while you are in your child bearing years..." or "if you need to have surgery..." a.k.a a hysterectomy, here is what we can "do" or "provide" for you. It sounds like a good thing and proper planning. For me, it made sense at the time. Most short term disability policies only pay a fraction of your wages. Therefore, you won't be fully provided for. FINE PRINT! There are always exceptions to the rule that will not cover your unique situation. Need I remind you that you aren't a cookie cutter made to fit into the mold of insurance. Visiting at the hospital after work. You will be able to save more money than you think by drafting a designated amount each month from your pay check and having a rainy day sick fund. I took out a short term policy with the plans of one day having a child. 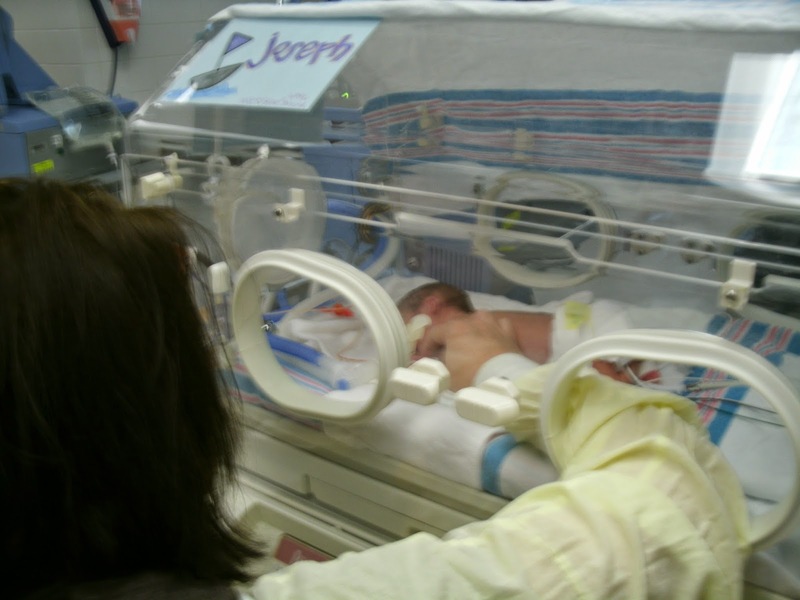 When I did have our baby, I had a 25 week preemie that spent a long time in the hospital. (6 1/2 months) Therefore I returned to work 2 weeks after his birth so I could save my remaining 4 weeks until after his coming home. Unum did pay for 2 weeks of leave when I had the baby. When I took this time off, I filed the appropriate paperwork and spoke with the insurance company several times to determine the best course of action for me to utilize my policy. Someone by phone agreed that I could get two weeks of benefits now and four weeks of benefits later (when my son came home from the hospital). And I, in my weakened and vulnerable state believed this. After all, I was entitled to 6 weeks of benefits. I had been paying for this service. And I was too tired and overwhelmed to read the fine print when the time came. Sadly this was not the case. I paid over $1200 in premiums to basically get nothing. In return, all I got was a letter telling me that my claim was denied and that it was "admirable that I was able to return to work so quickly after giving birth." If you don't think that is the ultimate slap in the face, you won't ever know the meaning of that phrase! So, my advice to working women is to have a rainy day health fund. Put the money up and when and if you have to use it, no one can deny it! It is yours. You aren't putting your faith in the hands of adjusters and greed driven corporate America! The worst decision I made was taking out that policy. I wasted both time and money. To me - time is money. Loss and loss. I'm not a fan of either! Rainy day heath funds can be a huge help for women at all ages and stages in life. While you are at it, keep saving. There isn't a rule that says you have to only save for maternity leave or lady surgery. Having a little bit of money tucked back can one day be cashed in on anything from new shoes to a fun trip you've always wanted to take! The best thing that a woman can do is arm herself with the facts! Face them with a fist full of money that you saved for yourself to save the day! I used to be afraid of home improvements. Outside of painting walls, hanging curtains and other simple tasks, I was calling in a handy man. More recently, I've gotten a little more adventurous. I think that this is partly due to You Tube videos that can be used to guide anyone through lots of household projects. We needed a new thermostat at home and with one viewing of a simple installation video, I decided to bite the bullet and get busy! I'm happy to report that upon completion no one filed for divorce or was sporting a new electrical charged hairdo! 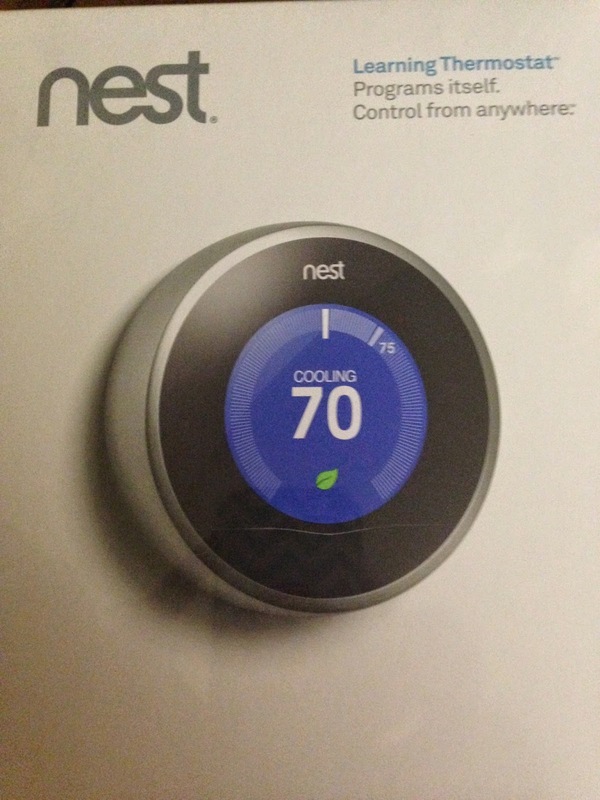 Thermostats can be bought with lots of bells and whistles. 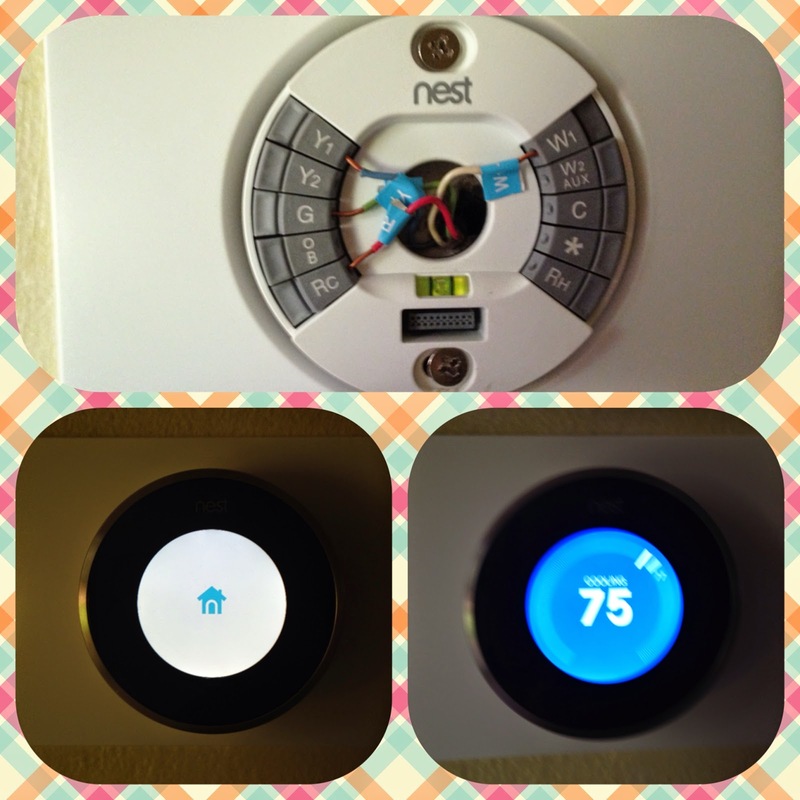 Nest is a learning thermostat that learns your patterns for heating and cooling over time. It can be controlled in house or through a smart app on your phone. Over time, it is designed to save energy and money. While that remains to be seen, we dove right in. Installation was simple and took around 15 minutes total. Set up only took a few more minutes. As with any project, get out your tools and turn off the power to the AC. I wanted to be double sure that I didn't get some unexpected excitement and turned off the main breaker. Even though the kit comes with a little screw driver, get our your screw drivers with multiple heads. 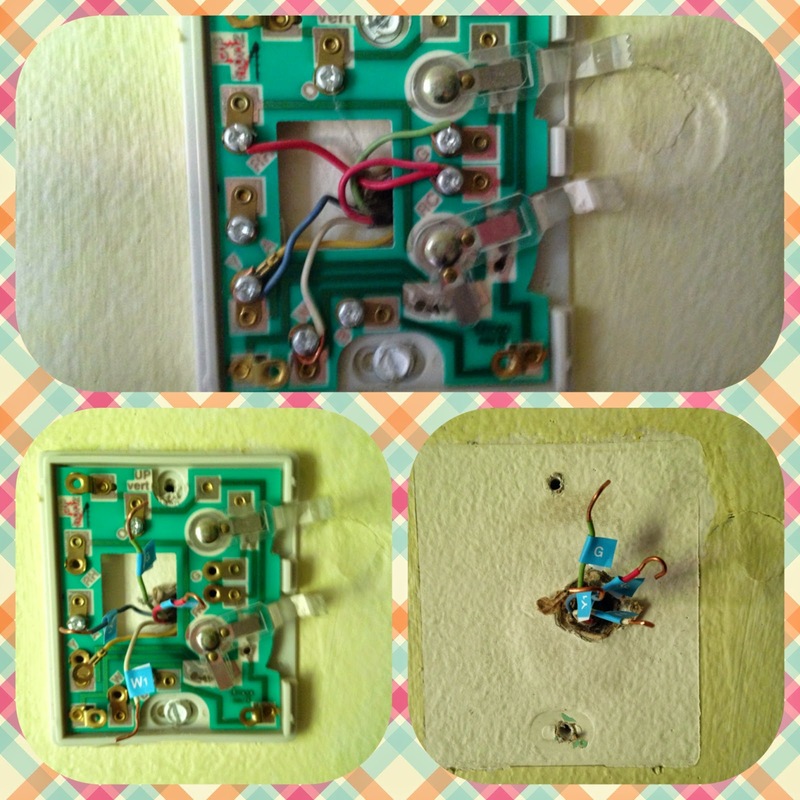 I had several screws to disconnect from our old thermostat. Also, I needed a drill to put in a new pilot hole and screw everything to the wall. After this, its a super simple deal! Take off the old thermostat plate. Label the wires before disconnecting. Install the new faceplate and go through installation project. After you have everything put into place, turn on the main breaker or AC breaker. This depends on what you had turned off initially. The Nest phone app can be downloaded from the app store and is free. From this app, you can change thermostat settings. This can also be done from an Internet connected computer. Over, time you will be able to track energy efficiency. So why does this thermostat make sense? It senses when you are away and puts your air/heat into "away mode" to save energy. A little green leaf appears when you are saving energy to help you reduce costs. If you are away and want to heat or cool the house prior to arrival, use your phone to change the settings so you don't come home to a hot or cold house. As you change the settings throughout the day, the thermostat will learn those patterns and start to adjust for you without you having to do a thing. The Next App is easy to set up! I purchased our thermostat at a local Lowe's. They can also be purchased online. Both the online and Lowe's price was the same for me. Finally, there are competitors to the Nest brand that you might want to consider if you are looking to make some changes around your house. 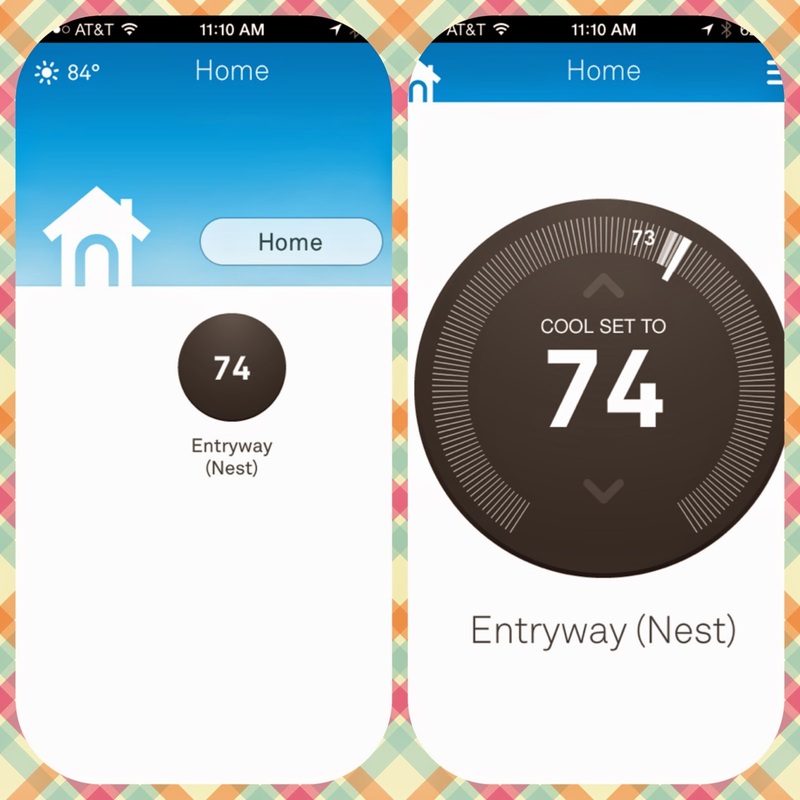 Iris has partnered with Lowes for a line of home management tools that includes thermostats, security and more! I only wanted to make the thermostat change, so Iris wasn't for us. However, Iris is less expensive. Ask me in a few months if it has made a change in our energy bills. I'm gambling on yes and hope I'm right. Overall, this was an awesome project. It was simple and fun. Nothing like a project that helps to save money that makes me feel like a winner. At the end of the day, that equals more shopping for shoes for me! I'm a subscription box junkie! There. I said it. Moving right along. But, what do you do when you get things that you already have or don't want? Swap it or gift it. Either way, there is something that can be done with the duplicated or unwanted subscription box items. My Subscription Addition has a swap where someone can browse the items she doesn't need/want. Its a great resource for beauty box subscriptions. You can also list items here to swap that you don't want to keep. Its free and is an easy way to get something you would rather have/use. Nail polish in a color that doesn't suit you. Add some nail files and clear top coat and you have an easy happy for someone else. Create a little gift bag of items for a visiting house guest of items such as face cream or lotion samples with some candy and hot tea. You could also do this as a hostess gift when visiting someone. Hot tea came in your box this month but you aren't interested or don't drink hot tea. Add a face mask and a candle for a little relaxation gift. There are lots of easy ways to have a gift ready to go with little effort. May Bluum Box items that we already have but are awesome! What about boxes for kids? This is the muse for what spawned this post. I have recently bought our son a new sun hat and some sunglasses. We are also overflowing with snack containers. All three of these items came in this month's Bluum box. No worries! I know several children the same age as King Diaper as well as expectant mothers. Spoiler alert! 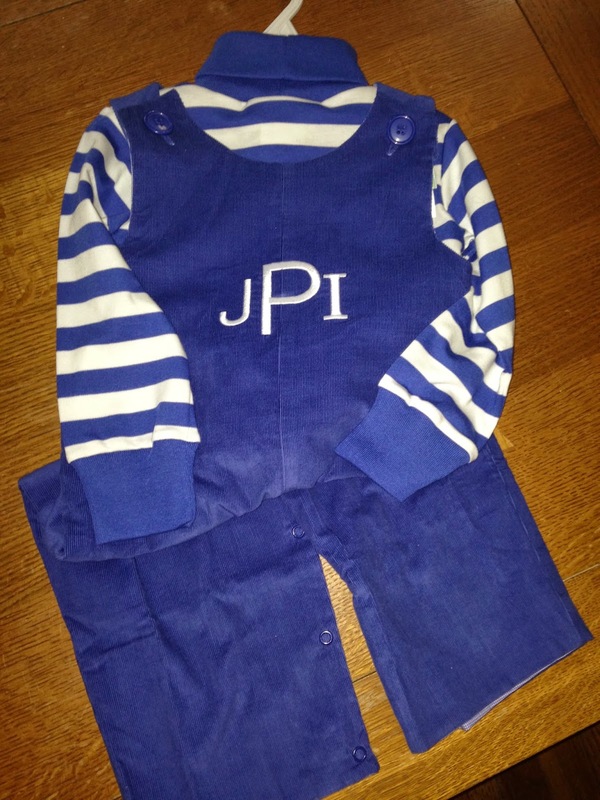 One lovely friend will be receiving this for their dear little one! I always keep some tissue paper and gift bags in my gift box, and we are set to go. As a matter for fact, I bagged these three items in a blue bag I have on hand. All I need now is some tissue paper, and I'm done! If you are shying away from subscription boxes based on the fear or unwanted items, put that worry to bed. There are tons of things you can do with what you don't want. By either gifting or swapping its a winning situation. Someone is getting something good. Rather nondescript and open ended! But, that's the whole point of the subscription box thing! And in the process, you will score some great loot for yourself or whoever else in the house might be on the subscription circuit. Yes, even my husband loves it! Sign up for something fun and wait to see what happens. Father's Day is just around the corner, and what are you getting dad? Last year, for our first father's day, I was completely lost as to what to get for King Diaper's daddy (aka my hubby!). While looking online for ideas, I came across a true winner. Every dad needs a hat! What could be better? I ordered Craig a simple hat that he has loved and worn every where! I had no idea that he would like it and completely took a gamble on that decision. One year later, its still a winner! His hat came from Goorin Brothers. Its just a simple fedora style hat that goes with everything. The Everyday Fedora is a winner. If you are looking for a timeless gift that dad will really like. Go for it! You won't be disappointed! What are some other ideas for dad? Magazine subscriptions are a great gift for someone in your life. Kindling Quarterly is a bit pricey, but it is a magazine geared specifically toward dad's. I'm a sucker for personalized gifts. 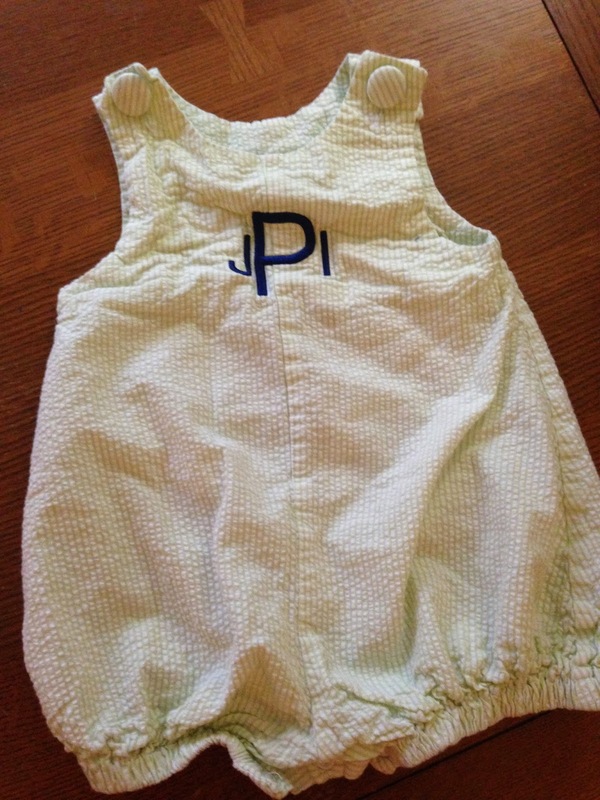 Tiny prints has lots of simple solutions that can be customized with ease. These kind of gifts really give the impression of time, thought and effort! Etsy has lots of great gifts that you can search for by occasion. Just type in Father's Day and see what all shop owners have to offer! If you are looking to make something for dad, I recommend things that are simple. Take a series of pictures with your children holding the letter's D-A-D, etc. Frame them and here is a great gift just for dad. Coupons for things like mowing the lawn, taking out the trash, etch. Those are always fun and easy! Put together a gift basket or bag full or dad's favorite snacks. Who wouldn't love that? Be creative and think about what dad really likes and enjoys. I have learned from my dear hubby that simple is always better and that men are way less complicated than we give them credit for. Whatever you do, make it something fun and personal. He's going to love it no matter the price tag. Its the effort and thought that went into the gift itself. Have a great Sunday. And get busy on Father's Day! Make it fun and memorable. Next year, you will be smiling and still remembering something special.